A tasty and soul warming gift for cool evenings this soup mix is delicious and just needs a few fresh add in’s to complete. 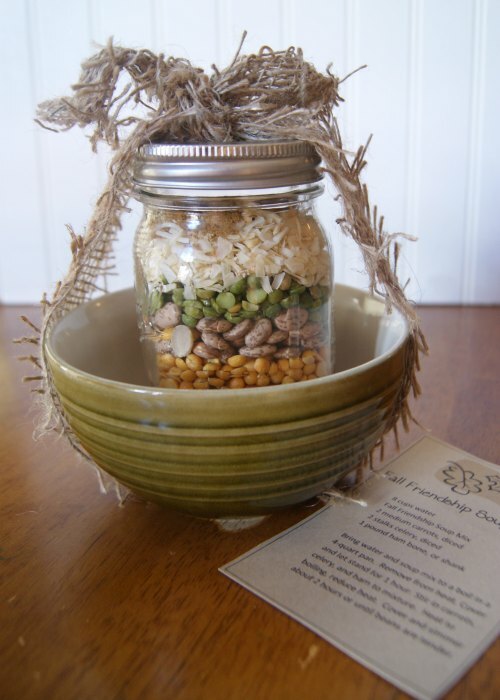 This mason jar soup mix makes a great hostess or housewarming gift. We’ve included a printable tag to finish it off. 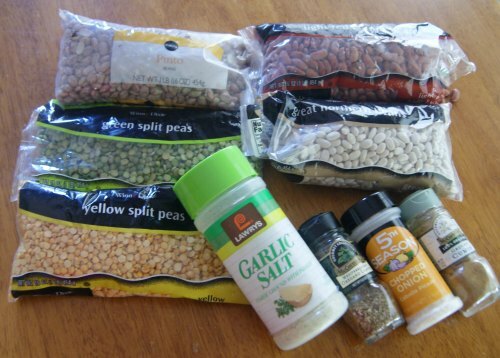 You should be able to get 4-6 soup mixes depending on the size bag of beans you use. 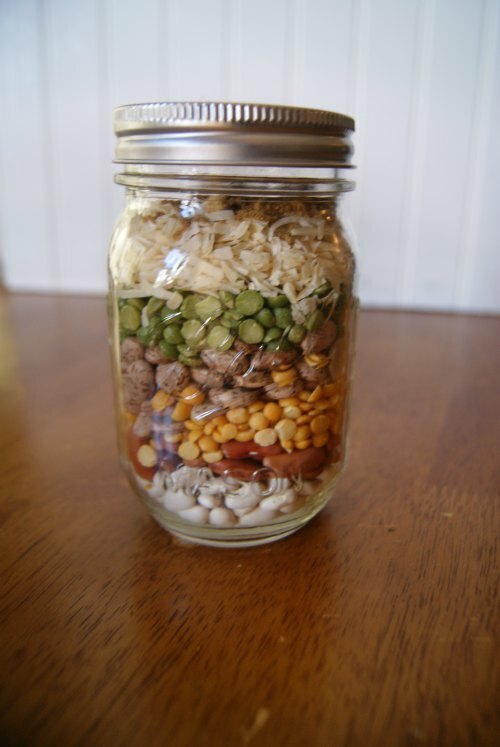 Layer ingredients in pint mason jar, ending with spices on top. Pour contents of soup mix in water, bring to a boil. Boil for 2-3 minutes. Remove from heat. Cover and let stand for 1 hour. Stir in carrots, celery, and ham. Heat to boiling, reduce heat. Cover and simmer for about 2 hours or until beans are tender. 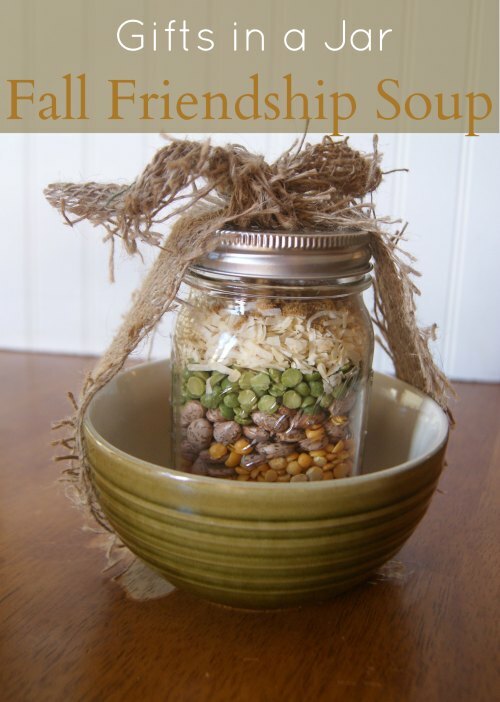 Place your jar of soup mix in a pretty bowl or set of bowls tie up with a ribbon, I used a strip of burlap for a country look. Keep an eye out on the clearance racks I got the bowl you see in the picture for about $2.00 marked down from $5, it is a heavy, excellent quality soup bowl. 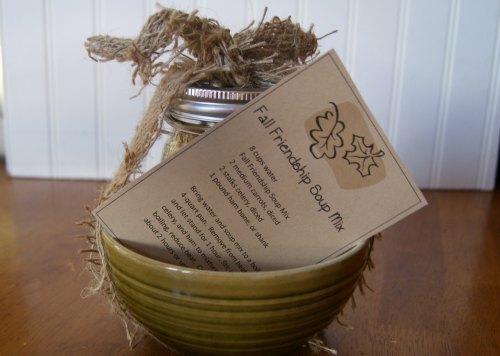 Print the gift tag (Fall Friendship Soup Mix Printable PDF) or hand write above directions and attach to your gift.